Setup Area: needs to be a level area with access to nearby electrical outlet. We provide a small table to set machine. Kids will come running for light and fluffy cotton candy treats, just like the ones at the fair! Your cotton candy machine rental includes a plastic bubble dome, to shield customers from floss sugar and keep unwanted debris or insects away of the machine. We recommend using with our Gold Medal brand supplies available here. 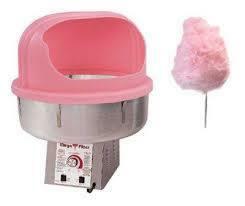 **Please note -- cotton candy is delicious and fun, but also sticky and messy! For this reason we do not recommend using cotton candy machines indoors, or anywhere you aren't prepared for a bit of a mess.